We are all set to recreate the magic of overnight theatre this 25th of January 2019! Natyasattak Rajani is on its way. So here are a few of the best performances we have picked up under one roof! Beautiful Classical Indian music and dance presented by Sharvari Jamenis & Mayur Vaidya with New Age charm, which unfolds Radha-Krishna Metaphor. 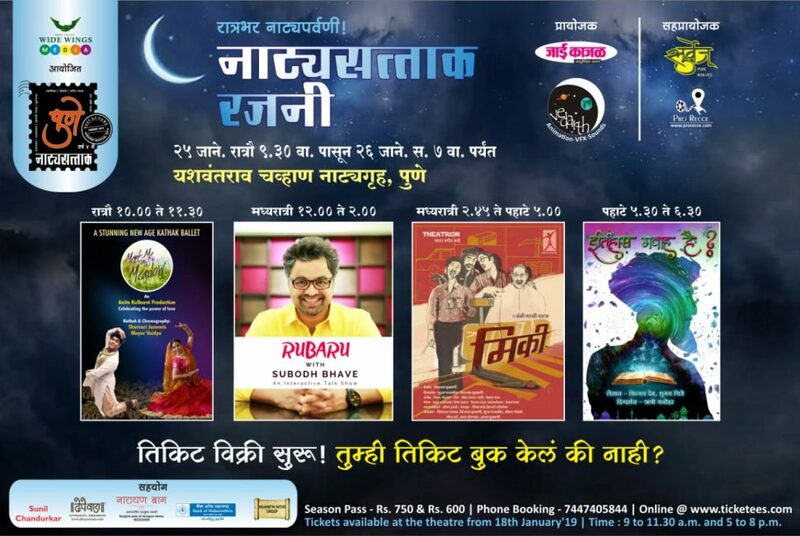 A solo show of our favourite actor Subodh Bhave, unfolding his journey as an actor, director & mentor; sharing of entertaining incidents and interesting people that he met during his journey. The play revolves around three barbers who form a twisted plan to use a dead body to solve their financial woes. The modern Shakespearean tragedy that follows is a character study of what happens to the best of us when the pressure is high. This play is not just restricted to acting, but it also includes live dance, music, and activities with a huge set and a very sound technical team. Based on a film writer while writing a historical biopic, travels back in time to find out that history can be partial. But then he faces opposition when he decides to change the film.